R. Luther discovered asteroid #53 Kalypso (goddess of silence). K. Reinmuth discovered asteroid #1716 Peter. L. Oterma discovered asteroid #2332 Kalm. The Convention on International Civil Aviation went into effect. Goethe Link Observatory discovered asteroid #1798 Watts, #2641 Lipschutz and #3070. Concrete pouring reportedly began for the first launch pad at the Soviet Baikonur cosmodrome. 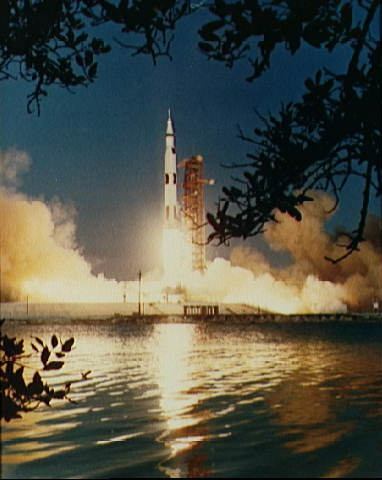 NASA launched Saturn/Apollo 6 (AS-502) as the final qualification of the Saturn V launch vehicle and Apollo spacecraft for manned Apollo missions. The unmanned Saturn/Apollo 6 mission, launched 4 April 1968, was designed as the final qualification of the Saturn V launch vehicle and Apollo spacecraft for manned Apollo missions. The spacecraft consisted of the three stage Saturn V, the Apollo Command and Service Module (CSM) and a boilerplate Lunar Module (LM). The primary objectives of the mission were to demonstrate structural and thermal integrity and compatibility of the launch vehicle and spacecraft, confirm launch loads and dynamic characteristics, and verify stage separations, propulsion, guidance and control, electrical systems, emergency detection system, and mission support facilities and operations, including Command Module recovery. Three major problems occurred during the mission. Two minutes and five seconds after launch, the Saturn V structure underwent a severe pogo oscillation, without damage to the spacecraft structure. Due to a manufacturing flaw and unrelated to the pogo oscillations, structural panels were lost from the Lunar Module adapter. Finally, after the completion of first stage firing and part way through the second stage burn, two of the five second stage J-2 engines shut down prematurely. The planned 175 km circular Earth orbit was not achieved, instead, after completion of the third stage burn, the spacecraft was in a 172.1 x 223.1 km, 89.8 min orbit. After two orbits, the third stage failed to reignite as planned, so the Service Module propulsion system was used to boost the spacecraft to an apogee of 22,225.4 km, from which the planned Lunar reentry simulation took place at 36,025 km/hr, slightly less than the planned velocity of 40,000 km/hr. The Command Module splashed down 80 km off target 9 hours 50 minutes after launch and was recovered in good condition. The USSR launched Salyut 2, intended to be a space station for experiments and observations, however, a thruster malfunction rendered it unusable. N. Chernykh discovered asteroid #2369 Chekhov. CERN achieved the first proton-antiproton beam collision (570 GeV). NASA launched STS 6 (Challenger 1, 6th Shuttle mission) to carry the Tracking and Data Relay Satellite-1 (TDRS-1) to orbit. The first Shuttle space walk occurred during this flight. NASA launched STS 83 (Columbia 22, 83rd Shuttle mission) carrying the Microgravity Science Laboratory-1 (MSL-1) experiment package to orbit. STS 83's launch was originally set for 3 April 1997, but was delayed 24 hours on 1 April due to a requirement to add additional thermal insulation to a water coolant line in the orbiter's payload bay. Managers determined that the line, which cools various electronic systems on the orbiter, was not properly insulated and could possibly freeze on-orbit. Liftoff on 4 April 1997 was then delayed an additional 20 minutes, 32 seconds due to an orbiter access hatch seal which had to be replaced. The first flight of the Microgravity Science Laboratory (MSL-1), the primary payload of STS 83, was cut short due to concerns about one of Columbia's three fuel cells, marking only the third time in the Shuttle program history that a mission ended early. (STS-2, 1981 and STS-44, 1991 were the other two times). Fuel cell number 2 had shown some erratic readings during prelaunch startup, but was cleared to fly after additional checkout and test procedures. Shortly after on-orbit operations began, the number 3 fuel cell substack differential voltage began trending upward. There are three fuel cells on each orbiter, each containing three substacks made up of two banks of 16 cells. In one substack of fuel cell number 2, the difference in output voltage between the two banks of cells was increasing. The fuel cells use a reaction of liquid hydrogen and liquid oxygen to generate electricity and produce drinking water. Although one fuel cell produces enough electricity to conduct on-orbit and landing operations, Shuttle flight rules require all three to be functioning properly to ensure crew safety and provide sufficient backup capability during reentry and landing. When a purge failed to halt the upward trend, the fuel cell was shut down. Additional purges and other measures failed to correct the anomaly, and around 10 a.m. on 6 April, the Mission Management Team ordered the mission to end early. Fuel cell number 2 was shut down for the remainder of the mission later that afternoon and safed. The crew was able to conduct some science in the MSL-1 Spacelab module despite the early return. Work was performed in the German electromagnetic levitation furnace facility (TEMPUS) on an experiment called Thermophysical Properties of Undercooled Metallic Melts. This experiment studied the amount of undercooling that can be achieved before solidification occurs. Another experiment performed was the Liquid-Phase Sintering II experiment in the Large Isothermal Furnace. This investigation used heat and pressure to test theories about how the liquefied component bonds with the solid particles of a mixture without reaching the melting point of the new alloy combination. Also conducted were two fire-related experiments. The Laminar Soot Processes experiment allowed scientists to observe for the first time the concentration and structure of soot from a fire burning in microgravity. The Structure of Flame Balls at Low Lewis-number experiment completed two runs. This experiment was designed to determine under what conditions a stable flame ball can exist, and if heat loss is responsible in some way for the stablilization of the flame ball during burning. A decision to refly the MSL-1 mission in its entirety was made by the Mission Management Team in the days following Columbia's return. The reflight was first designated STS 83R and then renamed STS 94. STS 83 ended on 8 April 1997 when Columbia landed on revolution 64 on Runway 33, Kennedy Space Center, Florida, on the first KSC opportunity for the day. Rollout distance: 8,602 feet (2,622 meters). Rollout time: 59 seconds. Orbit altitude: 184 statute miles. Orbit inclination: 28.45 degrees. Mission duration: three days, 23 hours, 12 minutes, 39 seconds. Miles Traveled: 1.5 million. The flight crew for STS 83 was: James D. Halsell, Mission Commander; Susan L. Still, Pilot; Janice E. Voss, Payload Commander; Donald A. Thomas, Mission Specialist; Michael L. Gernhardt, Mission Specialist; Roger Crouch, Payload Specialist; Greg Linteris, Payload Specialist. DMSP 5D-2/F14 (Defense Meteorological Satellite Program) was launched from Vandenberg AFB, California, on a Titan 2. NASA's MESSENGER probe started science operations in Mercury orbit.